It was early morning, Monday, January 21, 2019. I departed the motel room, swung my leg across my motorcycle, and pressed the ignition button. I was just north of Columbia, SC, on my way home to the mountains of Virginia. This would be the last leg of my journey. The fancy instrument display on my motorcycle went through its start-up functions and settled down to its static readout including ambient air temperature. It read 23 degrees F. “Not as cold as I thought it would be,” I said to myself. Just then my iPhone dinged a text message. It was my sweet wife with a warning: “The temperature at home is 6 degrees F with a wind-chill of -12. Stay warm!” But I am getting ahead of myself with this story. 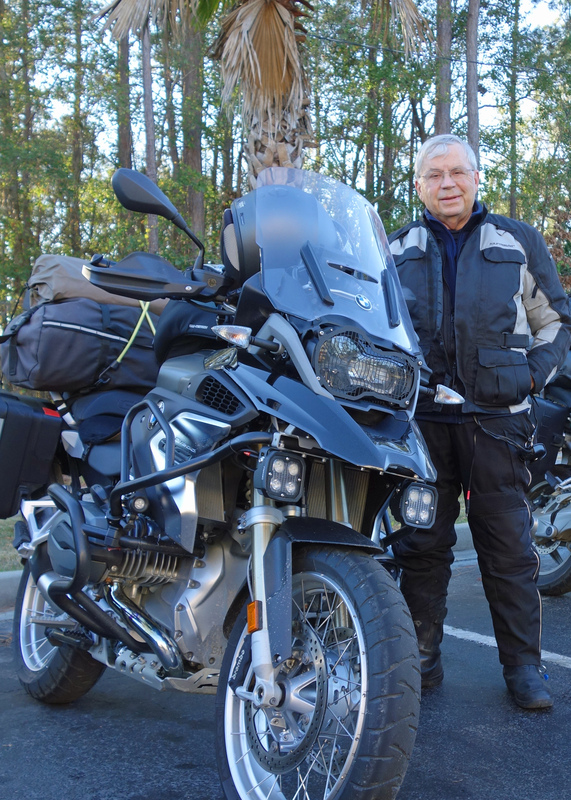 On the way to Florida on my new BMW R1200 GS. Five days before, my riding buddy Don and I departed Virginia for Florida. It was a cool 28 degrees when we left, but, as promised, it warmed up into the mid-40s after we dropped off the Blue Ridge Mountains into North Carolina. We were all smiles as the sun shone brightly and as we remembered that the temperatures at the North Florida BMW Rally were forecast to be in the mid-70s. 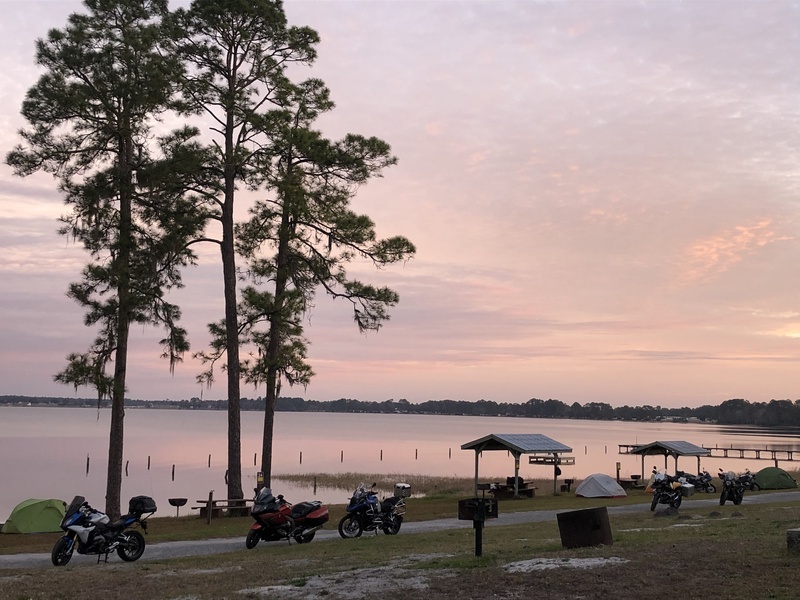 This north Florida annual BMW motorcycle rally is always the first of the New Year so it attracts a lot of riders from adjacent states in addition to Florida residents. The organizers capped attendance at 500 and it usually sells out by the first of December. Of course, when registering in November, there is no way of knowing what the weather will be in Virginia in mid-January, the dead of winter, but that is part of the adventure! Highway 301 from Columbia SC to our destination in Florida ran along the east side of the Okefenokee Swamp in southern Georgia. The Swamp is managed by the U.S. Fish & Wildlife Service. A visit instantly transports you into a unique environment populated by alligators, black bear, otters, rare birds, and unique carnivorous plants. We searched, but saw no bears, but saw lots of beautiful birds and a mid-sized alligator who was not the least perturbed by our chatter about his size—if only he would straighten his tail: Was he 7 feet or as much as 9? Ignoring my suggestion, Don wouldn’t grab his tail and straighten it out for a better estimate. 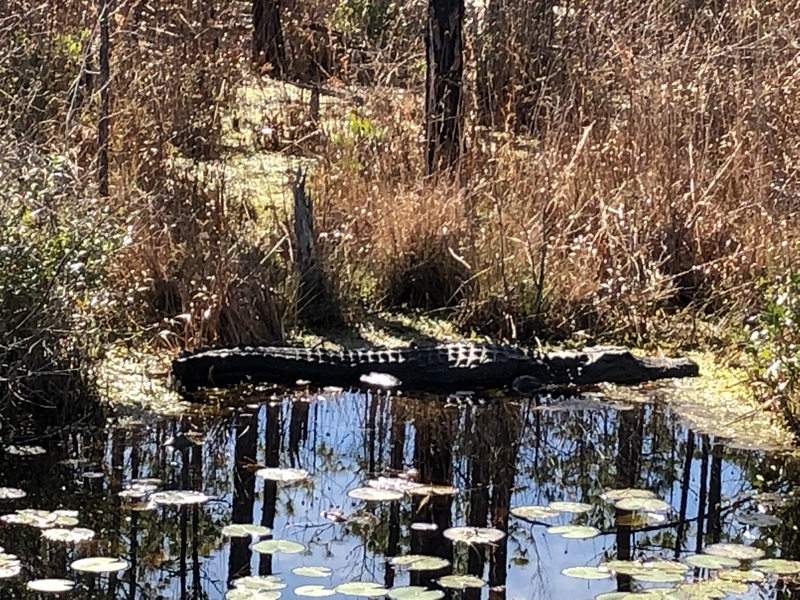 Alligator sunning himself during a cold January day. Camp Blanding Joint Training Center, the rally site, is the primary training base for the Florida National Guard. It is located on Kingsley Lake, an almost perfectly circular lake of about 2,000 acres about six miles east of Starke, FL. 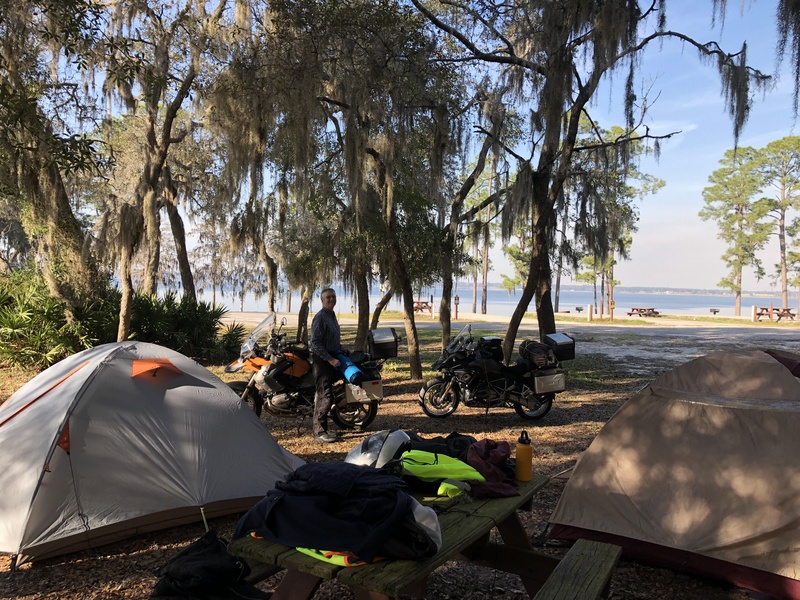 Just off the lake shore was a grove of live oak trees covered with Spanish moss that made a great spot for our tents. After a short ride to the Post Exchange for a couple of beers and snacks, the 45-degree evening pushed us into our down sleeping bags a bit early. Rally site on Kingsley Lake at Camp Blanding Training Center, Florida. That’s my riding buddy Don in our campsite in a live oak grove near the shore of Kingsley Lake. Lots of Spanish moss hanging from the trees. It was the summer of 1971 when I met Tony and Florence in Grafenwoehr, Germany. Just back from Vietnam, I was re-assigned to the 7th Army Training Command, the Army’s largest overseas training base which, at the time, was adjacent to the Czech border. Tony and I were two of five officer aviators responsible for the operation of the 24/7 full-service airport servicing the center. Over a period of a couple of years, Tony and his wife Florence and I became fast friends. 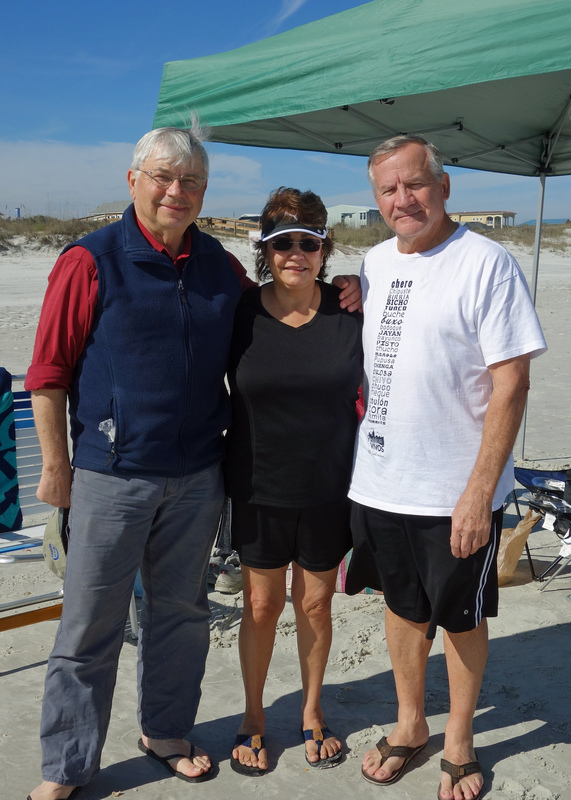 Long-time friends Tony and Florence on the beach near St. Augustine, FL. “Wow! That was almost 50 years ago,” I said, reminiscing about the old days while we partook a wonderful picnic lunch on the beach south of St. Augustine. I had called them a few days before we left Virginia to see if we could meet for lunch. “We could meet in some boring, noisy coffee shop for lunch or we could have a picnic on the beach in sunny, 75-degree weather; which do you prefer?” Florence asked. The intonation in her voice suggested that she had already made up her mind that we were going to have a picnic on the beach. “Sounds great,” I said. Florence and I have been friends for a long time; I’ve pretty much learned to defer to her judgment. Don and I had a nice hour-long ride from the rally site to their home, then it was a short ride in their 4-wheel drive truck to the beach. Florence was right; it was lovely. 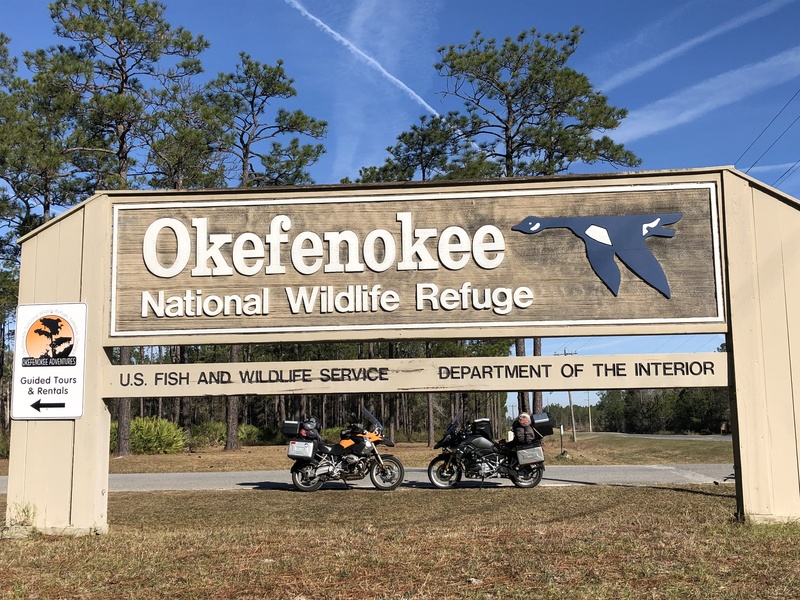 Saturday rally seminars on carburetor tuning, rider safety, and Sky Med rescue couldn’t keep us from a ride on Florida roads given the sunny weather and 78-degree temperature. We ended up in Gainesville, FL, a town I lived in with my family from 1975 to 79. Don and I visited some old haunts including the house my family lived in. The palm tree in the front yard was twice as tall, but otherwise, the neighborhood remained unchanged after 40 years. The highlight was a visit to the Florida Museum of Natural History on the University of Florida campus. It was everything you could possibly want to know about Florida’s unique habitats and cultural history. The museum houses 40 million specimens and cultural artifacts, including one of the world’s largest collections of butterflies and moths. Inside the butterfly rain forest at the Florida Museum of Natural History in Gainesville. 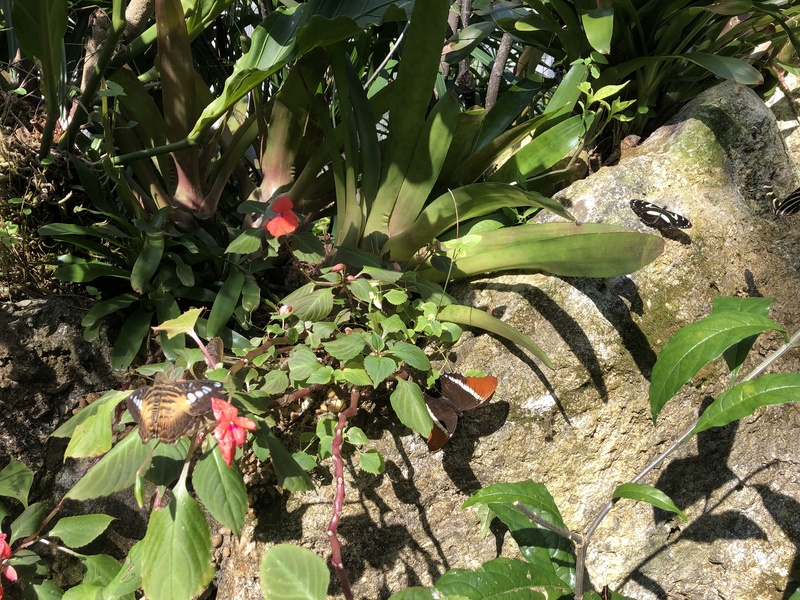 How many butterflies can you find in this photo? 500 to 1 odds are pretty good for a chance to win a new motorcycle. That was the grand prize and the winner would be announced at 8 pm Saturday night. Don was feeling lucky. But it wasn’t to be. Barbara someone won the BMW 310 GS. If not me, and not Don, I am happy a woman won. About one in eight BMW riders are women; we are always hoping for more. 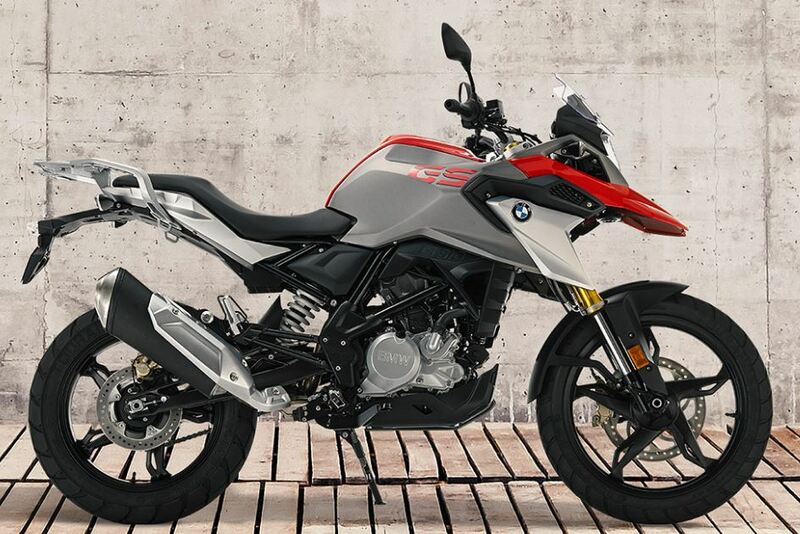 The rally grand prize, a BMW 310 GS. Within minutes of the grand prize drawing, Don and I were headed to a motel in Starke. Strong wind and rain were forecast to begin at 8 pm and last through the night. Instead of packing up a wet, sandy tent in the rain the next morning, we opted for a dry motel room before heading back north. I know, sounds a little wimpy. But there was nothing wimpy about a constant 20 mph crosswind with gusts along our route all the way from Florida to central South Carolina. And the temps the next day were going to be a true test of our preparedness. I returned my wife’s text message before Don and I rode out for the last leg home: “It’s a fairly mild 23 degrees here; maybe it will warm up a bit before we get home,” I said, wistfully. An hour into the ride it did warm up to 25 F, but dropped precipitously as we climbed the Blue Ridge Mountains at Fancy Gap, Virginia. At the top, it was 14 F and my intercom with Don stopped transmitting. I also got a warning light on my instrument display that the battery in my brand new key fob was at less than half power. Don reported that his tire-pressure sensor battery also flashed a warning. It seems that the cold temps were shutting down our batteries. Thankfully, our heated jacket and gloves were plugged directly into our motorcycles’ electrical systems rather than being battery powered. Climbing up the Blue Ridge mountains at Fancy Gap, Virginia. 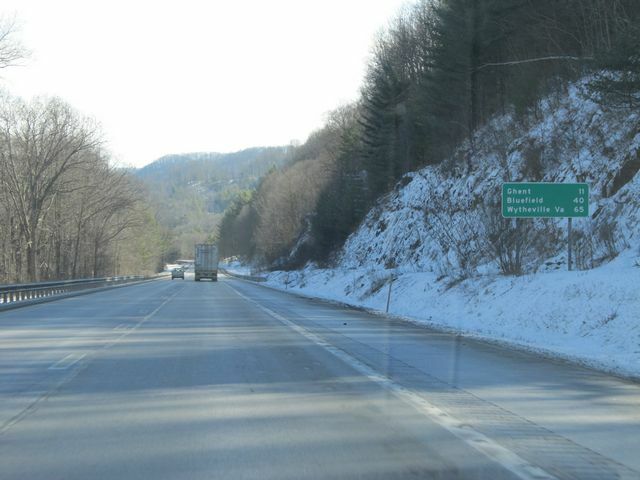 Well, it did warm up a bit; from 14 F at Fancy Gap to 18 F as I pulled into the driveway. Who knows what the wind chill might have been at 70 mph and crosswinds of 20 mph. I must admit that this was one time I was happy to get off my bike and cozy up to the wood stove. My sweet wife had hot coffee and soup and some leftover hot pizza waiting. She was happy to see me and did not opine about me being a nutcase when I told her how much I enjoyed the ride. Always good to see you Jim. Maybe Carol can fly down next time and we’ll pick her up. Be safe! Thanks again for a wonderful afternoon at the beach. Mostly crazy. Looking forward to seeing you in warmer environments. Thanks for sharing another adventure with us! I wouldn’t want to do it myself, but I’m so glad you have the opportunity to ride all over this country of ours and enjoy the ride, the company of your riding buddy and the people you meet, and the adventures you encounter on the way. May you stay healthy and enjoy many more rides! Love you! You are very kind, Sis. Thanks for that. Love you back.